Many leaves on only a few shoots may show symptoms. Apple mosaic virus. Photo taken at the Sidney quarantine station on an indicator cultivar. Slightly different patterns can be seen from leaf to leaf. 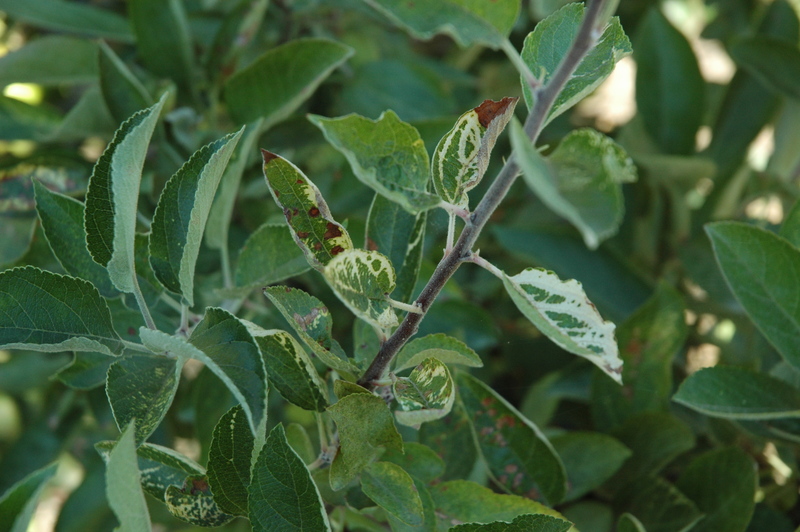 Cause Apple mosaic disease is caused by Apple mosaic virus. It is often found in mixed infections with several other viruses.There is no indication of field spread other than potentially through root grafting. ApMV, besides many Malus spp. and pear, occurs naturally in more than 30 mostly woody hosts including hazelnut, hop, Prunus spp., Rubus spp., Rosa spp., Betula spp., Chenomeles spp., and Aesculus spp. 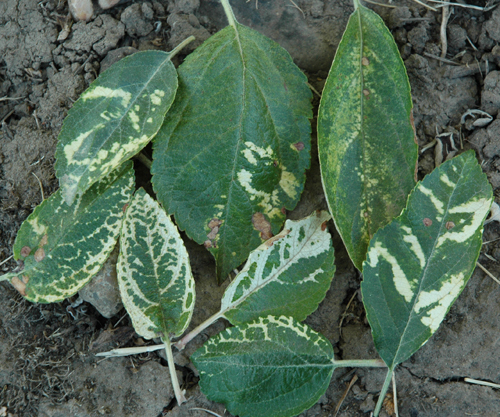 Symptoms Affected leaves exhibit dramatic white banding patterns on the leaves of many cultivars. 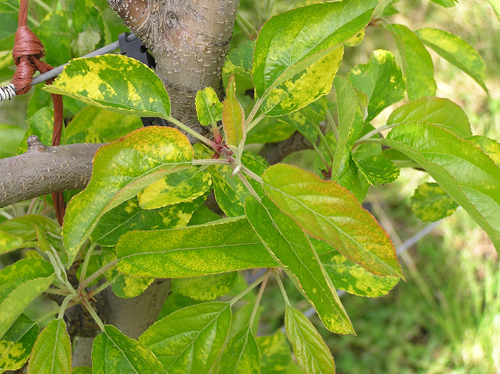 Pale yellow to bright cream irregular spots or bands along major veins can be found on leaves in the spring. Symptomatic leaves may drop prematurely. The distribution of symptomatic leaves may be erratic throughout the tree, or limited to a single limb. The number and severity of affected leaves also depends on seasonal temperatures, with the symptoms being more severe in years with moderate springtime temperatures. The disease can result in the loss of up to 40% of the crop depending on the cultivar. Usually symptomless in pear. The use of certified virus-tested (and found to be free of all known viruses) planting material is the preferred strategy for protection from this disease. Thermotherapy (24 to 32 days at 38°C) and/or apical meristem culture have been used to eliminate various viruses. References Posnette, A.F. and Cropley, R. 1956. Apple mosaic viruses. Host reaction and strain interference. Journal of Horticultural Science 31:119-133. Hadidi, A., Barba, M., Candresse, T. and Jelkmann, W. 2011. Virus and Virus-like Diseases of Pome and Stone Fruits. St. Paul, MN: APS Press.